τζαι οι σαλτιπάγκοι κλόουν του λένε ότι ο λόγος που το έκαναν ήταν για να διασφαλιστεί ότι δεν θα χρεοκοπήσει η οικονομία!!! και για να μην βρεθούν στην ανεργία 8000 και τόσες οικογένειες!!!!!! Δισεκατομύρια οι ζημιές των τοκογλύφων και επιμένουν τα τσιράκια τους ακελδησυένωση βολευτές Παπαγεωργίου και Μαυρίδης να λένε ότι θα πρέπει το κράτος να βοηθήσει τους τοκογλύφους………..
At the end of the second quarter 2008, Iceland’s external debt was 9.553 trillion Icelandic krónur (€50 billion), more than 80% of which was held by the banking sector. This value compares with Iceland’s 2007 gross domestic product of 1.293 trillion krónur (€8.5 billion). The assets of the three banks taken under the control of the FME totaled 14.437 trillion krónur at the end of the second quarter 2008. That afternoon, there was a telephone conversation between Icelandic Finance Minister Árni Mathiesen and UK Chancellor of the Exchequer Alistair Darling. That evening, one of the governors of theCentral Bank of Iceland, Davíð Oddsson, was interviewed on Icelandic public service broadcaster RÚV and stated that “we [the Icelandic State] do not intend to pay the debts of the banks that have been a little heedless”. He compared the government’s measures to the U.S. intervention at Washington Mutual, and suggested that foreign creditors would “unfortunately only get 5–10–15% of their claims”. The UK Prime Minister, Gordon Brown, announced that the UK government would launch legal action against Iceland over concerns with compensation for the estimated 300,000 UK savers. Geir Haarde said at a press conference on the following day that the Icelandic government was outraged that the UK government applied provisions of anti-terrorism legislation to it in a move they dubbed an “unfriendly act”. The Chancellor of the Exchequer also said that the UK government would foot the entire bill to compensate UK retail depositors, estimated at £4 billion. It is reported that more than £4 billion in Icelandic assets in the UK have been frozen by the UK government. The UK Financial Services Authority (FSA) also declared Kaupthing Singer & Friedlander, the UK subsidiary of Kaupthing Bank, in default on its obligations, sold Kaupthing Edge, its Internet bank, to ING Direct, and put Kaupthing Singer & Friedlander into administration. Over £2.5 billion of deposits for 160,000 customers were sold to ING Direct. The scale of the run on Kaupthing Edge deposits had been such that many transactions were not completed until 17 October. Although Geir Haarde has described the UK government’s actions over Kaupthing Singer & Friedlander as an “abuse of power” and “unprecedented”, they were the third such actions taken under the Banking (Special Provisions) Act 2008 in less than ten days, after interventions in Bradford & Bingley and Heritable Bank. «Greed is not a crime. 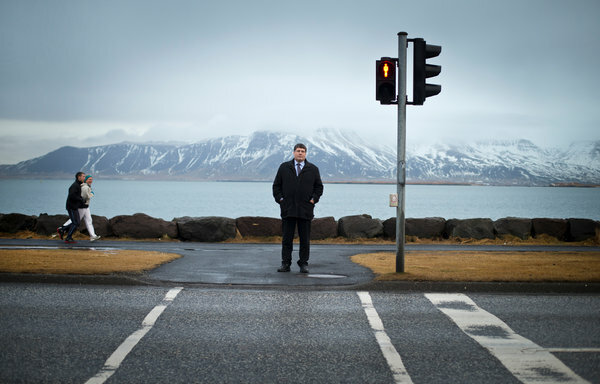 But the question is: where does greed lead?» said Olafur Hauksson, a special prosecutor in Reykjavik. With the global economy still struggling to recover from the financial maelstrom five years ago, governments around the world have been criticized for largely failing to punish the bankers who were responsible for the calamity. But even here in Iceland, a country of just 320,000 that has gone after financiers with far more vigor than the United States and other countries hit by the crisis, obtaining criminal convictions has proved devilishly difficult. Public hostility toward bankers is so strong in Iceland that “it is easier to say you are dealing drugs than to say you’re a banker,” said Thorvaldur Sigurjonsson, the former head of trading for Kaupthing, a once high-flying bank that crumbled. He has been called in for questioning by Mr. Hauksson’s office but has not been charged with any wrongdoing. Yet, in the four years since the Icelandic Parliament passed a law ordering the appointment of an unnamed special prosecutor to investigate those blamed for the country’s spectacular meltdown in 2008, only a handful of bankers have been convicted. Ministers in a left-leaning coalition government elected after the crash agree that the wheels of justice have ground slowly, but they call for patience, explaining that the process must follow the law, not vengeful passions. “We are not going after people just to satisfy public anger,” said Steingrimur J. Sigfusson, Iceland’s minister of industry, a former finance minister and leader of the Left-Green Movement that is part of the governing coalition. Mr. Hauksson, the special prosecutor, said he was frustrated by the slow pace but thought it vital that his office scrupulously follow legal procedure. “Revenge is not something we want as our main driver in this process. Our work must be proper today and be seen as proper in the future,” he said. And there are the bankers themselves. Those who have been brought in for questioning often bristle at being asked to account for their actions. “They are not used to being questioned. These people are not used to finding themselves in this situation,” Mr. Hauksson said. They also hire expensive lawyers. The special prosecutor’s office initially had only five staff members but now has more than 100 investigators, lawyers and financial experts, and it has relocated to a big new office. It has opened about 100 cases, with more than 120 people now under investigation for possible crimes relating to an Icelandic financial sector that grew so big it dwarfed the rest of the economy. To help ease Mr. Hauksson’s task, legislators amended the law to allow investigators easy access to confidential bank information, something that previously required a court order. Parliament also voted to put the country’s prime minister at the time of the banking debacle on trial for negligence before a special tribunal. (A proposal to try his cabinet failed.) Mr. Hauksson was not involved in the case against the former leader, Geir H. Haarde, who last year was found guilty of failing to keep ministers properly informed about the 2008 crisis but was acquitted on more serious charges that could have resulted in a prison sentence. Meanwhile, an investigative commission appointed by Parliament first reported to it in April 2010 and later published a nine-volume account of the financial crash, including a study of what philosophers charged with investigating ethical issues behind the crisis called a “moral void” at the heart of Icelandic finance. A woman initiates a transaction with Arion bank, formerly Kaupthing, a once high-flying bank that crumbled. Iceland has gone after financiers with far more vigor than the United States and others. Vilhjalmur Arnason, a philosophy professor at Iceland University who worked on the study, described the exercise as “very important for reasons of justice and for reconciliation” in a society traumatized by a crash so severe that it threatened to capsize the country. But, he added, bankers alone were not responsible, as “the whole society was so intoxicated” by values that put profit ahead of morality, the law and even common sense. After the crash, the new government pushed to restructure the failed banks, purging their former management and owners and prodding them to write off a big chunk of their loans to homeowners burdened with big mortgages. The government declined to bail out foreign bondholders, who lost about $85 billion. Iceland now has a growing economy. But it is not entirely clear that Iceland deserves its reputation as a warrior against Wall Street orthodoxy. In time, Iceland won praise from the International Monetary Fund for sharp cuts in spending and tax increases that slashed the government’s deficit and helped put the country back on an even keel. Certainly Iceland, in contrast to the United States and most other countries, has pursued not only little-known financiers but also many of the country’s biggest names in banking and business. “We have been aiming at the upper levels rather than the lower levels,” Mr. Hauksson said. His biggest scalp so far is that of Larus Welding, the former chief executive of Glitnir, one of the trio of banks that failed in 2008. Mr. Welding and a second former Glitnir executive were found guilty of fraud over a $70 million loan to a company that owned shares in the bank. Mr. Welding, who is now standing trial in a second case along with one of the country’s most prominent business tycoons, Jon Asgeir Johannesson, was sentenced in December to nine months in prison, six of which were suspended. The light sentence enraged many Icelanders, but, Mr. Hauksson said, “the important thing is that we got a conviction.” By contrast in Ireland, which put taxpayers on the hook for tens of billions of dollars owed by failed banks, the former chief of the failed Anglo Irish Bank has been charged with financial irregularities but so far no senior bank executive has yet been found guilty of a crime. Prosecuting bankers was never going to be easy, particularly in a country like Iceland, which is so small that nearly everybody in the capital has a friend or family member who worked at one time in finance. When Iceland’s Justice Ministry first advertised for applicants for the new post of special prosecutor, nobody responded. Mr. Hauksson, an outsider with no network of friends and relatives in Reykjavik, was then urged to apply during a second attempt to fill the post and was given the job. The high stakes have also left some investigators vulnerable to temptation: two former members of Mr. Hauksson’s staff were placed under criminal investigation last year for selling confidential information for 30 million Icelandic krona (around $233,000) to the administrator of a bankrupt company who was trying to locate missing assets. That episode has not dented Iceland’s heroic image among antibanker campaigners abroad. Mr. Sigfusson, the minister of industry, said he was regularly invited to speak on how Iceland dealt with its banking crisis. Iceland, he said, has “no magic solution” but has managed to push through unpopular cuts in spending in part because it managed to curb public anger by pushing for the prosecution of its bankers. Today, Iceland’s bankers are both mocked for their recklessness during the boom years and reviled for pushing the country to the brink of economic ruin. Μια περίεργη ιστορία η οποία προκαλεί πολλά ερωτηματικά φέρνει στο φως της δημοσιότητας το http://www.koutipandoras.gr. H υπόθεση αφορά τον αρχηγό του ΔΗΣΥ και υποψήφιο πρόεδρο της κυπριακής Δημοκρατίας, Νίκο Αναστασιάδη και κάποιες περίεργες επιχειρηματικές συναλλαγές, με πρωταγωνιστή τον ίδιο και το δικηγορικό του γραφείο. Ο υποψήφιος πρόεδρος της κυπριακής Δημοκρατίας διαθέτει ίσως ένα από τα πλέον γνωστά δικηγορικά γραφεία στην Κύπρο. Το γραφείο ιδρύθηκε το 1972 και δραστηριοποιείται κυρίως σε θέματα ναυτικού, αστικού και τραπεζικού δικαίου. Το 2000 ο κ. Αναστασιάδης αποφάσισε να συνεργαστεί με το δικηγορικό γραφείο Λεμής-Φιλίππου. Το deal προχωρά και το νέο γραφείο αποκτά των επωνυμία «Νίκος Χρ. Αναστασιάδης και Συνεταίροι». Με το γραφείο συνδέθηκαν δύο εταιρείες. Η Imperium Services Limited και η Imperium Nominees Limited. Μέτοχοι της τελευταίας είναι κατά 60% η κ. Έλσα Αναστασιάδη, κατά 20% ο κ. Στάθης Λεμής και κατά 20% ο κ. Θεοφάνης Φιλίππου. Τρία χρόνια μετά ιδρύεται η εταιρεία Makra Investments LTD, με μετοχικό κεφάλαιο χιλίων μετοχών, που η αξία της καθεμιάς δεν ξεπερνά τη μία λίρα. Οι μετοχές ανήκαν στην Imperium Nominees Ltd. Στην ίδια εταιρεία ανήκει και η Compaservus Nominees Limited. Μια εταιρεία υπηρεσιών που ανήκει στο γραφείο Νίκος Αναστασιάδης και Συνεταίροι. Το 2004 είναι μία χρονιά σταθμός για την Κύπρο. Ο κυπριακός λαός καλείται να αποφασίσει σε δημοψήφισμα για το περιβόητο σχέδιο Ανάν. Το πολιτικό θερμόμετρο στο νησί έχει ανέβει στα ύψη. Ένθερμος υποστηρικτής του σχεδίου είναι ο πρόεδρος του ΔΗΣΥ και σημερινός υποψήφιος για την προεδρία της Κυπριακής Δημοκρατίας Νίκος Αναστασιάδης. Ο κυπριακός λαός όμως θα εκφράσει την αντίθεσή του στο σχέδιο Ανάν με ένα ιστορικά υψηλό ποσοστό που έφτασε το 76%. Την ίδια περίοδο το γραφείο του κ. Αναστασιάδη συνεχίζει τις επιχειρηματικές του δραστηριότητες. Η Compaservus Nominees Limited πουλά τις μετοχές της Makra Investments LTD έναντι του αστρονομικού ποσού των 50 εκατ. δολαρίων. Έγγραφο της Τράπεζας Κύπρου, το επιβεβαιώνει. «Η εταιρεία Compaservus Nominees Limited… ανήκει στον όμιλο του γραφείου του Νίκου Αναστασιάδη όπου οι μέτοχοι είναι και συνέταιροι στο πιο πάνω γραφείο» και καταλήγει ότι «η συγκεκριμένη πράξη για 50 εκατ. δολάρια αφορά την πώληση μετοχών (υπόθεση εταιρείας Makras Investment Ltd) για την οποία σας ενημερώσαμε με επιστολή». Τα παράξενα όμως δε σταματούν εδώ. Τον Ιούλιο του 2008 η ίδια εταιρεία-η Compaservus Nominees Limited-προχωρά στη σύναψη ενός δανείου μαμούθ ύψους 9,917,050 ευρώ από τη ρωσική Τράπεζα «The joint Stock Bank “Sobibank’’. To δάνειο χορηγήθηκε από την Τράπεζα στην εταιρεία, βάζοντας ως ενέχυρο τις 5.000 μετοχές της. Σημαντική λεπτομέρεια; Η αξία των μετοχών της εταιρείας δε ξεπερνούσε το 1,71 ευρώ η καθεμία. Πιο απλά η εταιρεία έβαλε ως ενέχυρο μία αξία 8,550 ευρώ και εξασφάλισε δάνειο ύψους 10 εκατ. ευρώ περίπου. Πρωτοτυπία τεράστια, που ο κ. Αναστασιάδης θα έπρεπε ίσως να εξηγήσει με ποιον τρόπο κατάφερε να το επιτύχει. Το συγκεκριμένο δάνειο όμως δεν ήταν και το μοναδικό. Ένα μήνα πριν και συγκεκριμένα τον Ιούνιο του 2008 μία δεύτερη εταιρεία συμφερόντων του δικηγορικού γραφείου του κ. Αναστασιάδη, έλαβε και άλλο δάνειο από την ίδια τράπεζα. Πρόκειται για την Mareplex Services Ltd, στην οποία ιδιοκτήτες εμφανίζονται οι Έλσα Αναστασιάδη με ποσοστό 60%, Στάθης Λεμής με 20% και Θεοφάνης Φιλίππου με 20%. Η εταιρεία έλαβε δάνειο ύψους 9,917,050 εκατ. ευρώ, βάζοντας ενέχυρο 1000 μετοχές, η αξία των οποίων δεν ξεπερνούσε το 1 ευρώ η κάθε μία. Πιο απλά με 1000 ευρώ υποθήκη κατάφερε να λάβει ποσό κοντά στα 10 εκατ. ευρώ. Μάλιστα οι δύο εταιρείες εξόφλησαν τις επιβαρύνσεις από τα δάνεια στις λίγους μήνες μετά και συγκεκριμένα στις 17/12/2008, μέσω συμβολαίου ακύρωσης. Τώρα με ποια κριτήρια μία Τράπεζα χορηγεί σε δύο εταιρείες δάνεια μαμούθ, με υποθήκες εξευτελιστικά ποσά είναι κάτι που πρέπει να απαντηθεί. Στο μεταξύ η ρωσική τράπεζα Sobibank δεν είναι ένα τυχαίο χρηματοπιστωτικό ίδρυμα. Πρόκειται για έναν οικονομικό οργανισμό με ισχυρότατες πολιτικές διασυνδέσεις στη Ρωσία, η οποία ιδρύθηκε το 1990. Κατά το παρελθόν φέρεται να έχει πρωταγωνιστήσει σε ένα από τα μεγαλύτερα σκάνδαλα ξεπλύματος μαύρου χρήματος στη Ρωσία, με πρωταγωνιστές ισχυρούς επιχειρηματίες της χώρας, ακόμη και εγκληματικά στοιχεία. Συγκεκριμένα, από το 1996 έως και το 1999 ένα ποσό ύψους 7 δισ. δολαρίων έφυγε από τη χώρα. Δημοσίευμα των New York Times ανέφερε χαρακτηριστικά ότι το FBI είχε καταλήξει στο συμπέρασμα ότι η Τράπεζα, φέρεται να είχε πρωταγωνιστικό ρόλο σε αυτό. Έρευνα για το θέμα είχε διενεργήσει και το ειδησεογραφικό πρακτορείο Reuters. Το δημοσίευμα χαρακτήριζε τη ρωσική τράπεζα ως την «καρδιά ενός σχήματος μαζικού ξεπλύματος χρήματος ανάμεσα στους οποίους ήταν και ρώσοι επιχειρηματίες και εγκληματικά στοιχεία». Το πρακτορείο δημοσίευε μάλιστα και επίσημα έγγραφα δικαστηρίου, τα οποία αναφέρονταν σε ξέπλυμα χρήματος με μεταφορά παράνομων κερδών μέσα από σειρά επιχειρήσεων και τραπεζικών λογαριασμών, ώστε το παράνομο χρήμα να είναι νόμιμο. Τώρα το πώς εμπλέκονται οι δύο εταιρείες του υποψηφίου προέδρου για την Κυπριακή Δημοκρατία με μια τράπεζα που φέρεται να ξεπλένει χρήμα για ρώσους ολιγάρχες και εγκληματίες είναι κάτι που θα πρέπει να απαντήσει ο ίδιος. Όπως επίσης και πως κατάφερε να εξασφαλίσει με ψίχουλα δάνεια μαμούθ, μέσω της ρωσικής Τράπεζας. Το http://www.koutipandoras.gr επικοινώνησε με το γραφείο του κ. Αναστασιάδη, θέτοντας συγκεκριμένα ερωτήματα. Οι συνεργάτες του υποψηφίου προέδρου δεσμεύτηκαν να απαντήσουν εντός της ημέρας. Δείτε τα έγγραφα-ντοκουμέντα των συναλλαγών με τη ρωσική Τράπεζα. μίνιμου το κράτος δηλαδή οι φορολογούμενοι πολίτες θα επιβαρυνθούν για την «στήριξη» των τοκογλύφων τραπεζών 11 μέχρι και 21 ΔΙΣ! The governor of the Bank of Greece was given a severance payment of 3.4 million euros when he left his former employer, a major bank that he now regulates, documents seen by Reuters show. George Provopoulos was awarded the sum when he stepped down as vice-chairman of Piraeus Bank to become governor of Greece’s central bank and a member of the board of the European Central Bank in 2008. The scale of the pay-off, previously unknown to most Greeks, is likely to prove controversial, amounting to nearly 2.8 million euros ($3.6 million) after tax. As governor of the central bank, Provopoulos, now 62, has played a key role in propping up Greece’s banking system, which has received billions of euros in liquidity from the ECB and is in line for up to 50 billion euros of new capital from the bailout provided by euro zone countries and the International Monetary Fund. The Greek central bank has also faced criticism over the recent rescue of the country’s troubled state-run Agricultural Bank (ATE), whichleft-wing Greek MPs described as the «robbery of the century.» In that deal the authorities decided to place ATE’s non-performing loans into a ‘bad bank’ and hand the rest of ATE to Piraeus. Kotsovilis said details of the payment were reported in «the press and blogs of the period.» However, Reuters was unable to find mention of the payment despite extensive searches in both Greek and English. Provopoulos, a former chief executive at Emporiki Bank, Greece’s fifth largest bank, joined Piraeus, the fourth largest, on October 18, 2006. As a vice-chairman and managing director, he was entitled to a net salary of 580,000 euros, plus expenses and a bonus. On May 22, 2008 he resigned from Piraeus after 19 months service. Documents seen by Reuters indicate that, on the day before he left the bank, its directors approved a severance payment of 2,775,000 euros, in addition to his pay of 325,704 euros for five months work that year. The Bank of Greece confirmed the severance payment was 3.46 million euros before tax and was paid to Provopoulos that month. It amounted to more than two million euros per year of service. Almost a year later the deal appeared in minutes of a Piraeus shareholder meeting held on April 30, 2009, which sought retrospective approval for the payment. Though such shareholder meetings are open to the press, the payment appears to have passed unnoticed. George Gougoulis, the president of ESETP, a staff union within Piraeus Bank, was also unaware of the pay-off to Provopoulos. «We have repeatedly asked the Bank to disclose to us information about the way top executives and members of the Board are remunerated, for instance by stock options, and they have always refused that,» he said. The scale of Provopoulos’ payment is notable when set against what minutes of shareholder meetings record for payments to other directors who have departed Piraeus. Another vice-chairman, Theodoros Pantalakis, was on a similar level of remuneration at Piraeus to Provopoulos and left in December 2009 after working for the bank since 2004. He was given a pay-off of 470,000 euros, according to shareholder minutes, amounting to less than 100,000 euros per year of service. By comparison, Provopoulos’ pay-off was three times his after-tax annual compensation, according to the Bank of Greece. Michalis Colakides, another former vice chairman and deputy chief executive of Piraeus, left the bank in 2007 after seven years of service. Piraeus accounts record no severance pay for Colakides that year, though Colakides told Reuters that he received a payment equal to two years salary. He declined to comment further. In response to Reuters inquiries about Provopoulos’ financial arrangements with Piraeus, the Bank of Greece said that «detailed answers have been given to the Greek parliament», and other relevant authorities. The issue arose in parliament in 2009 because rumors had been circulating in banking and political circles about a large investment loss suffered by Provopoulos a few months after he left Piraeus. In September 2007 he and other senior executives of Piraeus had taken out loans from the bank to buy shares in a rights issue it was staging. According to one former Piraeus manager, all senior figures at the bank were asked to take part when the bank’s then executive chairman, Michael Sallas, announced he would raise 1.35 billion euros by issuing approximately 67m new shares. «Everyone got a letter that said something like: ‘Here is your allocation of shares. Your loan is pre-approved. Sign here! '» said the former manager. Bank of Greece rules allow banks to finance the participation of employees in rights issues. Piraeus declined to comment on the rights issue and the loans because of legal proceedings against Reuters. In May, Piraeus announced it was suing Reuters over an earlier report about the bank renting properties owned by companies run by Sallas and his family. The bank is claiming 50 million euros in damages. Reuters stands by the accuracy of its report. According to stock exchange records, on September 17, 2007 Provopoulos bought 212,911 shares in Piraeus, having purchased the rights to participate in the offer a week earlier. To cover the cost Provopoulos took a loan from Piraeus for 5,024,812 euros, according to his own later declarations. He bought another 23,250 shares on December 28, 2007, under a share option scheme. After leaving Piraeus, Provopoulos held onto his shares for three months while he was governor of the central bank overseeing the banking system. He had informed legal advisers and been told that «the ownership of the portfolio did not…influence in any way the legality of his duties», his office later told parliament. Provopoulos sold the shares in October 2008 after the collapse of Lehmann Brothers sent bank shares plunging. He realized 2,449,256 euros – far less than his outstanding loan to Piraeus. Speculation about Provopoulos’ debt to his former employer prompted Michael Karhimakis, then a Pasok MP, to ask questions in the Greek parliament. Provopoulos responded with a formal statement from the director of his office. It said he had suffered an «important loss» on his Piraeus shares and repaid his loan to the bank with the proceeds of the share sale plus a personal cheque for 2.1 million euros. The statement to parliament made no reference to the fact that Provopoulos had been granted a severance payment of 3.4 million euros by Piraeus. But Karhimakis, the former Pasok MP, told Reuters that, in his opinion, Provopoulos had a moral duty to disclose the payment and make clear his assets and their source. «This is a period when transparency for public figures is needed more than ever,» he said. Provopoulos’ salary as governor of the central bank is not published. But the Bank of Greece told Reuters his salary is 50 per cent lower than it was when he took office, after he had accepted two pay cuts during the country’s austerity drive. Provopoulos now receives an after-tax ‘monthly’ salary of 7,615 euros paid, as for many Greek public officials, 14 times a year, said the central bank. Σε μια αποκάλυψη βόμβα αναφορικά με την αποζημίωση που έλαβε ο νυν διοικητής της Τράπεζας της Ελλάδος, Γιώργος Προβόπουλος, όταν άφησε τη θέση του αντιπροέδρου της Πειραιώς, προχώρησε το ειδησεογραφικό πρακτορείο Reuters. Σε σημερινό του δημοσίευμα το πρακτορείο αναφέρει ότι ο κ. Προβόπουλος έλαβε αποζημίωση ύψους 3,4 εκατ. ευρώ όταν εγκατέλειψε τη θέση του αντιπροέδρου της Πειραιώς. Τα χρήματα αυτά, όπως αναφέρει το δημοσίευμα χορηγήθηκαν στον κ. Προβόπουλο, λόγω της ανέλιξης του σε μέλος του συμβουλίου της Ευρωπαϊκής Κεντρικής Τράπεζας και Διοικητή της Τράπεζας της Ελλάδος το 2008. Ουσιαστικά τα χρήματα αυτά δεν ήταν αποζημίωση, αλλά επιβράβευση της ανέλιξης του κου Προβόπουλου σε υψηλή θέση στην τραπεζική κλίμακα σε ευρωπαϊκό κι εθνικό επίπεδο. Στο δημοσίευμα γίνεται λόγος και στο ρολό κλειδί που έπαιξε ο κ. Προβόπουλος ως Διοικητής της Τράπεζας της Ελλάδος, «στην ενδυνάμωση του τραπεζικού συστήματος στην Ελλάδα, το οποίο έλαβε δισεκατομμύρια ευρώ σε ρευστότητα από την ΕΚΤ και περιμένει να λάβει ακόμα 50 δισ. ευρώ νέων κεφαλαίων από το νέο πακέτο διάσωσης από την ευρωζώνη και το ΔΝΤ». Μάλιστα στο δημοσίευμα γίνεται λόγος και για την κριτική που έχει ασκηθεί στον κ. Προβόπουλο για το θέμα της εξαγοράς της ΑΤΕ από την Πειραιώς, το οποίο «περιγράφεται ως η ληστεία του αιώνα». Και αναλύει το πώς η ΑΤΕ έσπασε σε good και bad bank, με το υγιές κομμάτι να εξαγοράζεται από την Πειραιώς. Τέσσερα περίπου δισεκατομμύρια ευρώ «φορτώθηκαν» στην Κυπριακή Δημοκρατία «εν μία νυχτί», τα οποία η Λευκωσία θα μπορούσε να γλυτώσει εάν δεν μετατρεπόταν η «Marfin Εγνατία Τράπεζα Ανώνυμος Εταιρεία» από θυγατρική εταιρεία, σε παράρτημα της «Marfin Popular Bank Public Co Ltd». Μια ενέργεια που μετατόπισε το βάρος των όποιων επισφαλών δανείων της «Εγνατία» από τους ώμους του Ελληνικού κράτους στους ώμους της Κυπριακής Δημοκρατίας, τα οποία σύμφωνα με πληροφορίες της εκτιμώνται πλέον στα περίπου 4δις ευρώ. Πολλά ερωτήματα εγείρονται περί τούτου αφού η μετατροπή της εν λόγω τράπεζας από θυγατρική σε παράρτημα της Λαϊκής, έγινε στις 31 Μαρτίου 2011, όταν η κατάρρευση της Ελληνικής Οικονομίας ήταν πλέον γεγονός. Περισσότερα δε ερωτήματα δημιουργούνται από το ύψος των επισφαλών δανείων που φέρονται να εντοπίστηκαν στην εν λόγω τράπεζα («Marfin Εγνατία Τράπεζα Ανώνυμος Εταιρεία»), περίπου 4 δισεκατομμυρίων ευρώ, εκ των οποίων πολλά αφορούν, σύμφωνα με πληροφορίες της «Κ», δάνεια για αγορά μετοχών χωρίς καμία εγγύηση και εξασφάλιση, όπως και για αγορές μετοχών σε Κύπρο και Ελλάδα. Παράλληλα σύμφωνα με την ίδια πληροφόρηση «περίεργα δάνεια» μεγάλων ποσών, εκατοντάδων εκατομμυρίων, έγιναν προς «Μονές και Μοναστήρια»(! ), με καθόλου ή μη ικανοποιητικές εγγυήσεις (!) τα οποία και πάλι θεωρούνται επισφαλή. Πολλές απορίες εγείρονται ως προς τον τρόπο που έδρασε ο πρώην Διοικητής της Κεντρικής Τράπεζας, κ. Αθανάσιος Ορφανίδης, ο οποίος έδωσε (μαζί με τον Διοικητή της Κ.Τ. της Ελλάδος) και το «ΟΚ» για να προχωρήσει η μετατροπή της «Marfin Εγνατία» από θυγατρική εταιρεία σε παράρτημα της «Marfin Popular Bank Public Co Ltd» σε περίοδο μάλιστα που οι πάντες γνώριζαν την κατάσταση της ελληνικής οικονομίας (Το Κυπριακό Πρακτορείο Ειδήσεων προέβηκε σε δημοσίευση της εξής Ανακοίνωσης Τύπου στις 31/3/11: «ΑΝΑΚΟΙΝΩΣΗ ΚΕΝΤΡΙΚΗΣ ΤΡΑΠΕΖΑΣ ΤΗΣ ΚΥΠΡΟΥ – 31 ΜΑΡΤΙΟΥ 2011 – Διασυνοριακή συγχώνευση μεταξύ της Κυπριακής Δημόσιας Εταιρείας περιορισμένης ευθύνης με την επωνυμία »Marfin Popular Bank Public Co Ltd» και της Ελληνικής ανώνυμης εταιρείας με την επωνυμία »Marfin Εγνατία Τράπεζα Ανώνυμος Εταιρεία»». (Η ανακοίνωση παραπέμπει σε σύνδεσμο στην ιστοσελίδα της Κ.Τ., κάτι όμως που δεν εντοπίσαμε, ενώ το αρχείο ανακοινώσεων της Κ.Τ. για ολόκληρο το Μάρτιο του 2011 εμφανίζεται άδειο). Άγνωστος πάντως παραμένει και ο ρόλος του Προεδρικού μιάς και είναι γνωστό, με δηλώσεις του κ. Βγενόπουλλου, πως είχε άμεση επαφή και επικοινωνία με τη κυπριακή ηγεσία, ενώ απο την όλη εικόνα δεν πρέπει να εξαιρείται το τότε πολιτικοοικονομικό κλίμα περι παραμονής της βάσης της Λαικής στη Κύπρο. Πάντως, είναι ξεκάθαρο, ότι εάν η «Marfin Εγνατία» παρέμενε με το καθεστώς της θυγατρικής, θα υπαγόταν στην εποπτεία της Ελληνικής Κεντρικής Τράπεζας, κάτι που θα συνεπαγόταν αυτόματα ότι οι εγγυήσεις για τις καταθέσεις στην Ελλάδα θα αποτελούσαν υποχρέωση του Ελληνικού Ταμείου Προστασίας Καταθέσεων και από την άλλη, η θυγατρική θα είχε το δικαίωμα κεφαλαιοποίησης της από το «Ελληνικό Ταμείο Χρηματοοικονομικής Σταθερότητας καθώς και πρόσβαση στο Ελληνικό «Emergency Liquidity Assistance» για σκοπούς αντιμετώπισης προβλημάτων ρευστότητας. όλο στην απόφαση είχαν Βγένόπουλλος, Ορφανίδης και Προβόπουλλος. Άγνωστη παραμένει η αντίδραση του Προεδρικού.